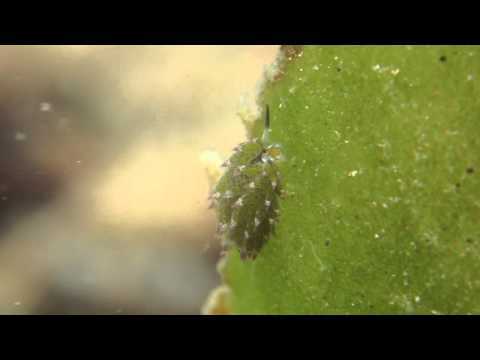 Just when you think you've seen it all, along comes a tiny species of sea slug known as Kuroshima's Avrainvillea Slug. The name comes from the Japanese island where it was first discovered. Its scientific name is Costasiella kuroshimae. This little guy is amazing for two reasons. First, it has the ability to make its own food through the process of photosynthesis. Its second amazing feature is its looks. This little guy bears an uncanny resemblance to a day-glo sheep! The tiny Costasiella kuroshimae grows to only 5mm in length. The blue antennae look like sheep's ears. Just like their namesakes, the Sea Slugs are vegetarians that feed on marine algae. We all learned in elementary school that plants use photosynthesis to make their own food. What is so amazing about these Sea Slugs is that they are able to do the same thing. They can use photosynthesis to make food. Single-celled organisms are usually the only living creatures, other than plants, that are capable of photosynthesis. But our little slug-sheep can perform a little trick called kleptoplasy. This allows the slug to separate the chloroplasts from its food. It can then incorporate the chloroplasts into its own body. So basically what we have here is a tiny, solar-powered sheep that lives in the ocean. Oh, and we can't forget its most appealing feature: it is adorable! Check Out This Cute Little Fellow In Action!